(Nanowerk News) Researchers at North Carolina State University have used computational modelling to shed light on precisely how charged gold nanoparticles influence the structure of DNA and RNA – which may lead to new techniques for manipulating these genetic materials. The work holds promise for developing applications that can store and transport genetic information, create custom scaffolds for bioelectronics and create new drug delivery technologies. In their model, the researchers manipulated the charge of the gold nanoparticles by adding or removing positively charged ligands – organic molecules attached to the surface of the nanoparticle. This allowed them to determine how the nucleic acid responded to each level of charge. 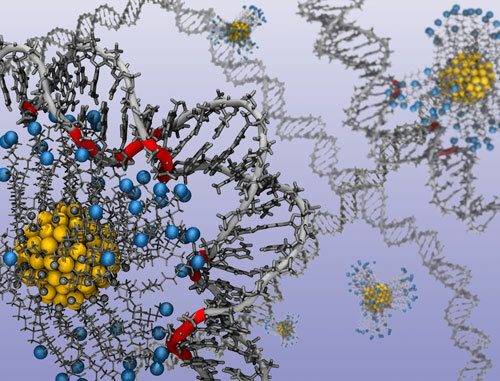 Watch an animation of a nanoparticle and ligands shaping a strand of DNA. “This will let researchers know what to expect – how much charge they need in order to get the desired curvature in the nucleic acid,” says Yaroslava Yingling, an associate professor of materials science and engineering at NC State and corresponding author of the paper. The work is also significant because it highlights how far computational research has come in materials science. The research team is now building on these findings to design new nanoparticles with different shapes and surface chemistries to get even more control over the shape and structure of nucleic acids.